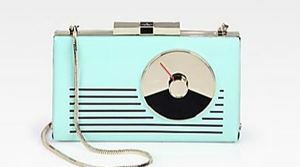 WHY: Dial up the chicness with this fun ’60s-inspired radio-shaped clutch. Kate Spade knows the appeal of a vintage vibe, and the perpetually adorable brand isn’t afraid to bring the noise with this glossy patent leather number. The seafoam hue of this kitsched-up clutch feels retro yet modern at the same time. Groovy, non? Correspondence We Actually Received: Is Lady Gaga's Wheelchair Necessary?